What!? You Forgot to Credit My Blog!? Right now I am so upset that my hands are shaking. My mind is racing, my heart is pounding. I can hardly type. On the one hand, I am flattered, G.P.! Flattered that Debra Ollivier chose to excerpt my blog in her soon-to-be published-by-you book What French Women Know. On the other hand I am having a heck of a time calming myself down. Pacing. Rattled. Why? You may have guessed. She didn't attribute a full page of well-crafted prose to me. Nope, she instead simply said "Take this typical blog posted by an American woman in a Parisian grocery store," then proceeded to quote one of my most popular blog posts on French Flirting. How popular is that post, you ask? Excellent question, G.P. Putnam. It is very, very popular. You know how to Google, don't you, G.P.? Try googling the phrase "French Flirting" and see what pops up first. Not merely on the first page of Google hits, but THE number one. Why, goodness me, that's the very post she used in her book. Look, look, G.P.! A bit of history. A few weeks ago I was flattered to receive an email from Debra Ollivier, asking me to review a galley proof of her book, and to apologize for inadvertently failing to attribute a quote from my blog. "At last I found you!" she said, with a drawn-out story about how it had been too difficult to track down and credit the source. Neither she nor her editor (your editor) had been able to find me! Pourtant, G.P. Putnam, I am no shrinking violet. No Writing Wallflower! Polly-Vous Francais is anything but anonymous. And here is my quandary, G. P. Putnam. As soon as FedEx delivered the book today, I kicked off my shoes, got my reading glasses, and guiltily ignored the pressing need to send out more job applications. I wanted to dive right into the book; I knew it would be a tour de force. I had actually forgotten about the pesky attribution issue Debra had mentioned weeks earlier. "Hmm, this book is really, really good," I was thinking to myself as I read. "So intelligent. So well written." Then I reached page 25, and saw the quoted text. "Oh goodie, this is me!" was my first reaction. Yes, she had quoted it properly, precisely. The section of my blog post (the original is here) continued on page 26, taking up a full page of her book. "Wee! She likes me!" I first thought, glowing with pride. I continued reading for a bit, but a nasty feeling started creeping over me. Wait a sec. Wait a sec. This isn't RIGHT! And that, G.P. Putnam, is when I started shaking in anger. This wasn't just a little blurb. It was a full page! Dear, dear, G. P., I think you must have copy editors who know how to check quoted text by inserting it into a Google search and seeing what pops up. And then to give FULL CREDIT to the writer. Don't you? Alors, now what, G.P. Putnam? Do I keep blogging away, unpaid, my work unattributed in your book? Do I jump up and down and scream and say "How about me? How about MY writing?" for a while? Do I point out the little copyright sign at the bottom of my blog and start calling dial-a-lawyer? But I'm not going to take this lying down. Today marks the 65th anniversary of the Liberation of Paris. All around Paris there are daily reminders of the Liberation, such as this plaque. Read more here. Starting at 4:45 pm today there will be an official ceremony at the Hotel de Ville in Paris, including une Evocation Historique en 5 Actes. Additionally, a smaller ceremony at the Mairie of the 7e arrondissement will take place at noon. Rachida Dati, other elected officials, and Anciens combattants will commemorate the anniversary. 116 rue de Grenelle. If you are not in Paris, but have a half hour to spare, do yourself a favor and watch this documentary, filmed in secret during those weeks in August -- from the first insurrections in mid-August to the victory parade with the 2nd French Armored and 4th US Division. It includes General De Gaulle's famous "Paris brisé! Paris martyrisé! Mais Paris libéré!" speech. It's all in French, but you'll understand. Paris in August. Paris au mois d'août. It is decidedly not like the other eleven months. What do you think of Paris in August? Charles Aznavour had his opinion. There are juillettistes who prefer to take vacation in July. And aoûtiens who prefer to be away in August. I've offered a few reflections of my own from time to time. Peacefulness. Parking. Men. In no particular order. And don't get me started on the OO vs. OOT pronunciation. But being ever so open-minded, I value others' opinions. So, the Polly-Vous Francais Homegrown INSEE/Gallup Poll is asking you to fill in the blank. Paris in August is _________________________. I pine for Paris all the time. But nothing makes me miss Paris more than a nice long chat with Mary Blake on Skype. We gossip, we laugh, we share secrets (heh heh). We critique and compliment. She's in her atelier in Montmartre, her cat Lucie climbing across the computer keyboard. Her cobblestone courtyard outside the door. Sacre Coeur just up the hill. I'm in Virginia. Well, I'm in Virginia. Trees, hills, deer, fireflies: verdant bucolic splendor. After an hour or so of talking at each other's screen faces (wearing the same reading glasses from Pylones, it turns out), when we hang up I'm always good for a 15-minute self-pity sobfest. I love my life here, but I want to be in Paris! Yes, I have lush greenery, but Mary Blake also has trees. 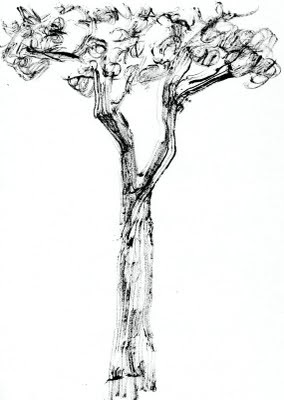 Her most recent works focus on the trees of Paris. Check out her entire blog, Painting Paris. Her trees are sheer poetry. Image: copyright Mary Blake 2009. Labels: arts and entertainment, where am I?